The Sir John Johnson Branch of the UEL is happy to announce that their 2017 Winter newsletter is now available online in PDF format. The news letter has some great photos and lots of news. A hot lunch will be served. Download a printable PDF copy of announcement. Download a printable PDF copy of this announcement. Winter has arrived; this is a good time to look back on our Branch activities in this year. 20 May: Branch President Michel Racicot attended the Annual General Meeting of Quebec Anglophone Heritage Network (QAHN) held in Montreal, QC. 10 June: Our Branch 50th Luncheon and Annual Meeting, held at the Centre EuroSpa in Saint-Ignace-de-Stanbridge, QC, was attended by 44 members and guests. 20 June: Branch President Michel Racicot participated at the UELAC Central East Regional Meeting held in Kingston, ON. 5 August: Branch Picnic at the BCHS Museum in Knowlton, QC. 15 August: We were guests of the Glengarry, Nor’Westers & Loyalist Museum, in Williamstown, ON. 19 August: Past President Gerald Thomas and President Michel Racicot participated at BCHS Gala Fundraiser “Night at the Museum” held in Knowlton, QC. 25 October: Michel Racicot, Evelyn Lewis, Jo-Anne Savage UE and Gerald Thomas represented the Branch at Heritage Branch Charter Night Dinner, in Montreal, QC. 6 November: Michel Racicot, Evelyn Lewis, Adelaide Lanktree UE, Louise Hall UE . Edwina Jenne UE and Roderick Riordon UE attended the Canadian Club of the Yamaska Valley’s conference given by Branch member Joanne Croghan, in West Brome, QC. Upkeep of Sir John Johnson Burial Vault: in addition to maintaini ng the site, we have pre- pared a new interpretative panel about the War of 1812 Ve terans buried inside the vault, panel which will be installed on site next summer . This winter, we intend to prepare and print two informative brochures about the history of the Johnson family and the ir burial vault. In 2017, our Branch had 51 members, a decrease of 5 members from the previous year. We do hope to increase our membership in 2018. Please help us by completing the 2018 membership renewal (page 7) and mailing it with your cheque to our Membership Chair, Adelaide Lanktree UE. Our main concern is not only increasing our membership, but also finding new members to join and participate actively on the Branch Executive. Progress was made in 2017 as we now have a new member on the Executive. We do hope that others will consider joining the Branch Executive. Michel Racicot, President. As the New Year approaches us, we wish all of you a Wonderful 2018. We would like to take this opportunity to thank you for your support and friendship over the years. Happy New Year! Annual fees for the year 2018 are due by 20 December 2017! Click here to download PDF version of Membership form. In 2017, Sir John Johnson Centennial Branch is celebrating its 50th Anniversary and Brome County Historical Society, its 120th. For this special year, our Branch Annual UEL Picnic will be held with Brome County Historical Society's Picnic on Saturday, 5 August 2017. Bring your lunch and lawn chair. Rain or shine, we will have the picnic. To celebrate this anniversary, a special feature will be presented on the Museum Grounds at 11 a.m.
Home Child is a play inspired by a true story of the Townships’ forgotten past. Played by two actors, it will be performed outdoors. Everyone is welcome. Interested in a guided tour of Williamstown, please give us your name before July 15. Depending on the number of people coming, we will be travelling either by minibus or bus. The cost for this day trip will be very affordable. More details coming at a later date. A reminder that it is with great pleasure that we invite you to a “Late Breakfast” followed by our Semi-Annual General Meeting that we be held Saturday, 29 October 2016, at the Restaurant O Patio, 601 du Sud Street, in Cowansville. Arrival time 11:30 am. Members and guests of Sir John Johnson Centennial Branch enjoyed two very special occasions in June 2016. 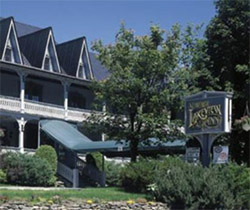 First, our 49th Annual General Meeting and Luncheon was held on Saturday, 11 June at the Lakeview Inn “one of Québec’s most prestigious and charming historical inns”, located in Knowlton, Québec. During the luncheon, a special ceremony took place to recognize and thank three important partners of our Branch. You will find our report on page 2. Second, a special plaque unveiling ceremony honouring Sir John’s service in the War of 1812 took place at the Johnson Family Burial Vault in Mont-Saint- Grégoire on 23 June. You can read about this special ceremony on page 4. Looking ahead, there will be one more important Branch activity this summer, our Annual Picnic on Saturday, 20 August. Again this year, we have been in- vited by our Branch 2nd VP Marven Beattie to his home, the ViewMount House in Dunham. All are invited. More information on page 8. Looking further ahead, our Branch will be present at Townshippers’ Day which will be held again this year on the Brome fairgrounds on 17 September. Then in October or early November at the latest, we will hold our semi-annual general meeting. More details about this meeting will be sent to you at a later date. Since 2010 with 94 members, our membership had been decreasing every year reaching, hopefully, a low last year with 53 members. In 2016, we have 56 members as of July, with five more months to go. Let’s try to increase that number before the end of the year. I am counting on all of you. Click here to download PDF of meeting invitation. Our Branch was well represented at Heritage Branch Spring Dinner held on April 22nd. 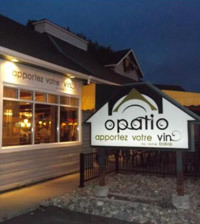 Members Adelaide Lanktree, Louise Hall, Michel Racicot and I enjoyed their hospitality and a very nice dinner. In May, we submitted the Johnson Burial Vault Restoration for the Prix du mérite patrimo- nial Fleur bleue. Although we did not win an award, we were among the finalists. On June 20th, we had our Annual General Meeting at the All Saint Anglican Church Hall, in Dunham, Quebec. On August 6th, some of our members had a very enjoyable Picnic at ViewMount House, in Dunham, home of our 2nd Vice President Marven Beattie. Then on August 15th, several members participated at the Paul Holland Knowlton Day, held at the Brome County Historical Society Museum. The highlight of this event was celebrating the success of the restoration of the house of Paul Holland Knowlton, founder of Knowlton and grandson of Loyalist Luke Knowlton. On September 12th, members Michel Racicot, Adelaide Lanktree and I participated at Townshippers’ Day held at Brome Village, Quebec. On October 28th, Past President Roderick Riordon, 2nd Vice President Michel Racicot and I represented the Branch at the Heritage Branch Charter Night Dinner. The restoration of the burial vault of Sir John Johnson and of members of his family was completed in 2014. It had been our priority project for many years. From now on, our Branch new project will be promoting this historic place and maintaining the site’s integrity. In recent years our Branch membership has been decreasing. Probably our biggest challenge in the present and near future is finding ways to attract new members. Memberships are the lifeblood of our association. We need to find ways to increase our membership. Any ideas? We are counting on all of you to help us increase active participation in our branch’s activities. Bring a picnic lunch and a lawn chair. We hope for good weather and a good turn out and look forward to seeing you there. All are welcome. However... In case of rain, the picnic will be cancelled. Download a PDF with driving directions by clicking here. Fred Gilman’s Picnic will be held by the Veterans Coalition of Vermont – MBA, MOA, MOWW & AFA and hosted by ROA. At the Gilman home on Lake Champlain, 1720 Gilman Street, Clarenceville, Quebec Directions: On Route 202, between Clarenceville and Venise-en-Québec, take Lakeshore Road (going south). Continue to Street 2 (rue 2), turn left and go to Gilman Street. Finally winter is behind us and summer has already showed its colors. It is time to invite you to our 48th Annual General Meeting. 2014 was an exciting year for both UELAC and Sir John Johnson Centennial Branch. UELAC celebrated its 100th Anniversary and as part of its celebration presented Sir John Johnson Centennial Branch with a donation which greatly aided in the restoration of the Sir John Johnson Burial Vault on Mont Saint-Grégoire, formerly Mount Johnson. The Re-Consecration Ceremony of the Johnson Burial Vault was held on Saturday, 23 August 2014. A commemorative book “Loyally Yours 100 years of the UELAC” was compiled and published by Frederick H. Hayward, UELAC 2014 Centennial Chair, and each branch member received a UELAC 100 Year pin. Saturday, June 14, 2014, saw members and visitors gather at the Legion Hall in Philipsburg for the Branch Annual Meeting. Prior to the meeting a delicious roast beef dinner, prepared by the members of the Legion was enjoyed by all. Robert Wilkins said Grace, Okill Stuart proposed a Toast to the Queen and following the meal, Edwina Jenne Bougie thanked the members of the Legion for the meal on behalf of the members. President Gerald Thomas welcomed everyone, especially Robert and Moira Wilkins and Okill and Sylvia Stuart from Montreal and three from the USA, Bill Glidden, Gene Hicks and Linden Witherall. Wesley Larocque presented the flag and Robert Wilkins led the members in the singing of God Save the Queen. In the absence of a Secretary, Adelaide Lanktree volunteered to be Secretary. Since 1998, the restoration of the burial site of Sir John Johnson has been the top priority of our Branch. We are glad to report that the restoration is now completed. The Re-Consecration Ceremony of the Johnson Burial Vault will be held on Saturday, 23 August 2014. You will find attached the invitation and information for the ceremony. You are all invited to the ceremony. The ceremony will be followed at 1:30 p.m. by a cold buffet which will be served at the nearby Vergers & Cidrerie Denis Charbonneau at an all-inclusive cost of $20 per guest. Those interested in participating are requested to RSVP and make payment to Mrs. Adelaide Lanktree before August 10, 2014. It is time to invite you to our 47th Annual General Meeting. Finally winter is behind us and summer is already showing its colors. It is time to invite you to our 46th Annual General Meeting. We hope for good weather and a good turn out and look forward to seeing you there. All are welcome. In case of rain, the art gallery will be set up for us to use. We will have plenty of time for a leisurely afternoon picnic and touring the museum. The current exhibit at the museum is The War of 1812 at Missisquoi Bay. The price of entry for those who wish to visit the museum will be $8.00 for non- members and free for those who are members of the Missisquoi Museum. Payment may be made at the door but please remember that we must pay for the number of places we reserve. Follow Chambly direction; it will lead you to Fréchette Blvd. At the end of Fréchette Blvd, turn right on Bourgogne St. The fort will be on your left not too far after the bridge. There are 2 parking lots (P1) and (P2). In Chambly, there are road signs indicating the fort’s location. The new picnic area offers 14 tables at your disposal inside the fort’s marvelous park. Please note there are no shelters in case of rain. The parking lot and the picnic area are FREE. 2011: UELAC 2014 Centennial Project Update. Now available online and in PDF format. Unfortunately, we have had to increase the dues for 2011, but only enough to cover the increase voted at the 2010 UELAC Annual General Meeting last June to cover rising costs. The Dominion per capita fees are now $40.00 for individuals and $55.00 per couple. Our Branch fees remain unchanged at $2.50 per person, making the total that you have to pay: $42.50 for individuals and $60.00 per couple. Admission is free for Missisquoi Museum members and $10.00 for non members. We hope for good weather and a good turn out and look forward to seeing you there. In case of rain, the picnic will be cancelled. "Shadow Soldiers of the American Revolution"
TOPIC: "How I spent my Summer Vacation"
Fees for 2010 are due on or before December 15 2009! We hope for good weather and a good turn out and look forward to seeing you there. However... in case of rain, the picnic will be cancelled. Guest speaker: Heather Darch, Missisquoi Museum. If you need help with transportation, call us. Parking at Imprimerie Farnham Inc., 180 Principale West. celebrating 150 years of the railroad in Farnham. The Sir John Johnson Centennial branch of the U.E.L.A.C. are mourning the loss of one of their most loyal and dedicated members, Mrs. Jean McCaw, who passed away suddenly at her home in Sutton, Quebec on February 4th, 2008. Jean was born in Sutton in 1921, educated there and then continued her education to graduate as a registed nurse from the Queen Elizabeth Hospital in Montreal, Quebec. Jean was married to the late Sydney McCaw who predeceased her in 1992. She leaves to mourn her passing 4 children, 9 grandchildren, 12 great grandchildren and a sister. Jean and her husband returned to Sutton after their retirement and joined the Sir John Johnson Centennial Branch in 1982. Jean was a regular documented member, descended from Loyalist Adam Best, and soon after joining took on the duties of the branch genealogist. An office that she diligently carried out until the fall of 2007 when due to diminishing eye sight she reluctantly resigned from the post. A large number of the branch members, as well as those of the beginning of Little Forks branch, owe their documentation to Jean's dedicated research. To celebrate the Bicentennial of the settlement of United Empire Loyalists in the Eastern Townships of Quebec, the branch undertook to create a book , which was a collection of articles recording the history of these Loyalists. Jean was one of the most active participants in this project, and the book, 'Loyalists of the Eastern Townships " was published in 1984. 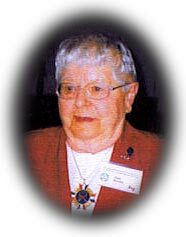 On June 8, 2001, Heritage Branch invested Jean as a ' Companion of the Most Honourable Order of Meritorious Heritage' in recognition of her contribution to the United Empire Loyalist Association. Jean was active in her Community and Sutton's Grace Anglican Church, as well as a dedicated volunteer at the Brome County Historical Society in Knowlton, Quebec. Her guiding hand and advice will be greatly missed by her friends in the Sir John Johnson Centennial branch . A Memorial Service at Grace Anglican Church will be held later in the Spring.